Thanks to the guys and girls in the sports information department at Notre Dame for sending me their 2012 football media guide. Not many schools still send out media guides any more, but I always say “thanks” to the few that do. Media guides are an extremely helpful resource and they make covering a team a thousand times easier. 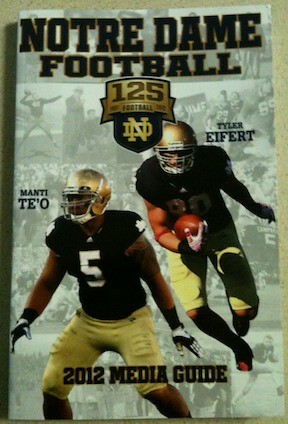 Further, Notre Dame has made their guide a little smaller in size (instead of the traditional larger magazine size). Personally, I prefer the smaller size and find that it is easier (and thus more likely) to take with me when I travel. This entry was posted in Media Guide, Notre Dame by Travis Normand. Bookmark the permalink.